DESCRIPTION: Blond Me Premium Care Developer from Schwarzkopf is an oxidant specially formulated to provide unrivaled quality for blond hair. The perfect combination for coloring and whitening products. 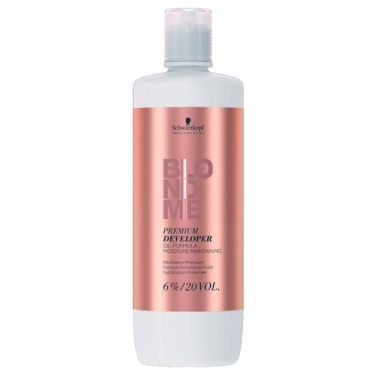 With moisturizing properties it maintains the balance of natural hair hydration proactively, as it contains protective agents that surround the yarn during the application when used with the coloring and bleaching products of the Blondeme line. This product can only be used with BLONDEME products. Perfect for a supreme quality of blond hair and a stunning blond look. Its formula brings KeraLamination technology that restores keratin lost by hair and regenerates its elasticity, while silk infuses hair with deep nourishment and softness. The result is perfectly laminated hair with an exceptionally soft surface, ensuring brightness and radiance.